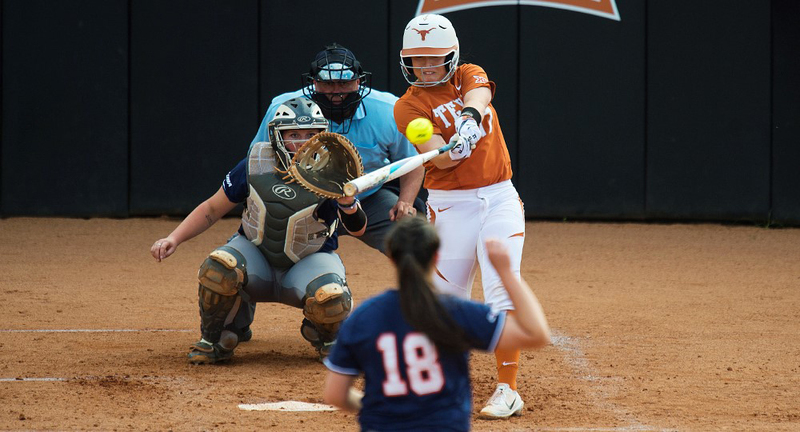 Catcher Taylor Ellsworth had 14 extra-base hits, five home runs and 22 runs batted in for the Texas softball team in 2018 (photo courtesy of texassports.com). AUSTIN, Texas — The Texas softball team enters the 2019 season with high expectations … and it appears the college softball community agrees, as the Longhorns are ranked No. 9 in the first preseason poll issued by Softball America, a new publication affiliated with Baseball America. The rankings are established by Softball America staff and a group of select Div. I head coaches. This year is the first season since 2014 in which the Longhorns have started the season in the top 10; UT kicked off that season ranked No. 10 in both the USA Today/NFCA and ESPN.com/USA Softball polls. The defending national champion Florida State Seminoles start the season atop the national poll, followed by Washington, UCLA, Oklahoma, Florida, Georgia, Arizona and Tennessee. Michigan rounds out the top 10, one spot behind Texas. The Longhorns start the season with nine players who got into at least 50 games a year ago, and a total of 13 letter winners. The returning corps accounted for 84 percent of the team’s runs, 81 percent of the hits, 71 percent of the doubles, 80 percent of the team’s home runs, 77 percent of the runs batted in and 92 percent of the stolen bases. Texas is less experienced in the pitcher’s circle, where the hurlers who accounted for 42 percent of the team’s victories and strikeouts return. Second baseman Janae Jefferson returns to lead the offense after a 2018 season in which she hit .392, scored 30 runs, had 74 hits including 11 doubles, stole 11 bases and drove in 24 runs en route to National Fastpitch Coaches Association (NFCA) All-America honors. Other top returners are junior outfielder Kaitlyn Washington, senior pitcher Brooke Bolinger and catcher Taylor Ellsworth. Washington hit .359 last year, with 56 hits, 21 runs scored, 13 doubles, three home runs and 20 RBI; Bolinger posted a 13-7 record with an earned run average of 2.20 with eight complete games and four shutouts; Ellsworth had 38 hits including 14 for extra bases, five home runs and 22 RBI. Washington and Bolinger earned NFCA All-Central Region honors last year. The Longhorns open the season Friday, February 8 when they host Northwestern State at 4:30 p.m. and then Boston College at 7 p.m.